Shirts dont get the support they need from the paltry hangers. Invest in some solid wooden ones for shirt storage that will help to hold the shirts shape more. Not necessary to go to the other extreme and buy those top-of-the-line felt coated, diamond crusted hangers either. 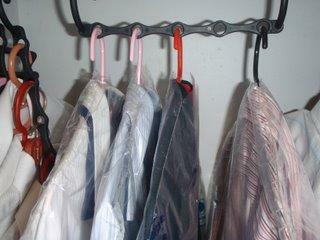 Shirts are quite light in weight, and dun need such strong hangers. 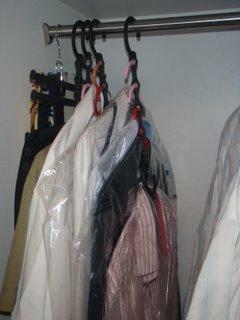 Wire hangers might be cheap, but they rust and leave a stain on your shirts. Stay away from them. Wooden hangers are quite affordable. Walmart sells them for about a dollar each, so no excuses that they are too expensive. 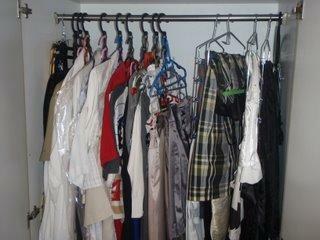 Full view of my actual wardrobe. There are womans cloths on the right because I like to get in touch with my feminine side. No not really, my girlfriend Joyce stays with me, and she gets half the wardrobe. To make your shirt storage tidier, you might consider going to the local Walmart or dollar store and buying a whole bunch of hangers at one time. 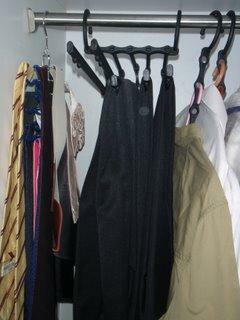 It feels great to open the wardrobe and see a whole line of same hangers. Your closet will look less cluttered and more streamlined. Mismatched hangers are visually distracting, making picking out an outfit harder. They will not tangle as much. Matching hangers slide right up and right in next to each other without getting caught on one another. It looks pleasing to the eye when you open your wardrobe early in the morning. A close up of how it looks when collapsed. 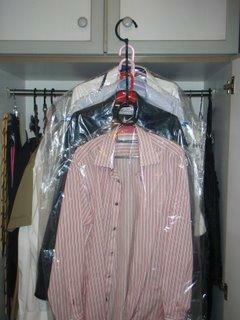 To prevent wrinkles, I use plastic laundry bags to cover all my ironed shirts. The shirts are tailor made Italian cotton, and the collapsed organizer puts them in close proximity. The plastic bags act like a lubricant, allowing the shirts to look fresh as morning dew when I wear them a few days later. A little trouble I admit, but respect your shirts, and they will respect you. Another view of the collapsed shirt organizer, it really does save quite a lot of space, and this was something I bought a whole bunch of. 8 to be exact. I include pants under the catagory of shirt storage, because they come together. 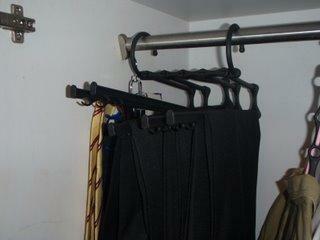 A good trouser hanger maintains a sharp crease and causes as few wrinkles as possible at the fold. 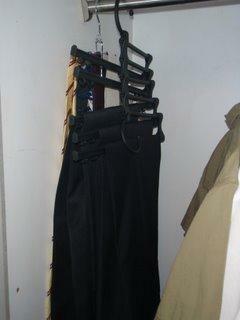 Personally, I use a pants organizer bought from the same company as the shirt organizer above. Pants organizer expanded. You can easily see how many dark colored pants I own. Might be looking to expand the range of colors soon. Final look at the pants organiser. You can pull out the individual hooks for easy access. As above, do contact me if you wish to purchase some.